Two weeks have passed since the last post and not much has changed, weather wise, here in New England. 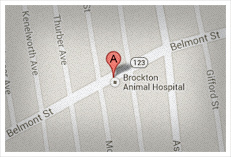 So in the spirit of being the hearty group we are let’s continue to move forward with our lives and pay particular attention to a few additional concerns that always seem to surface at the Brockton Animal Hospital during this trying season. Previously we covered the importance of maintaining the schedule and environment of our dogs and cats. Let’s take a moment to list a few other points we should be aware of in avoiding a more cautionary tale during this record winter. -Antifreeze is a highly toxic and often fatal substance that dogs and cats will consume. Most poisonings occur in the colder weather. Beware. -When walking our dogs during the night or early morning we are less visible than we might think. Darkness, snow banks, dirty windshields, tired plow drivers all contribute to the outdoor dangers. Invest in a reflective jacket and a flashing red light that can be attached to the pet’s collar. Bicycle lights work very well and usually have clips that can be adapted. -Our pets still need their exercise regardless of how difficult the outdoor travel is or how busy we have become at home. Take some time with both the felines and the canines to run around the house, play with them and their toys and basically to engage in fun activities. As stated in the last post their physical as well as their mental health depends on maintaining as much of a normal routine as possible. -Even though most pets have a fur coat to protect them, extreme cold may result in additional stress for your pets. Bringing outdoor pets indoors, turning up thermostats, pet jackets and sweaters, additional blankets on beds and moving pet beds to sunny areas can all help to reduce this discomfort. Physical stress leads to physical illness. It is important to be aware of anything that may lead to additional stress for pets. -Garbage in…..Garbage out. An important rule during the colder months is trash should be taken outside or to the outdoor trash cans as soon as leftovers, bones or containers go into it. Takeout and eating in becomes more common during these winter months. Our personal comfort makes us a bit hesitant to run outside with the leftovers and containers so these remnants may sit around for a while. We may forget about them but our four legged friends certainly do not. “Dietary Indiscretion” strikes often and, in the least, results in severe gastrointestinal distress. At the most, intestinal obstruction, surgery and lifesaving medical care may be required to undo this forgetfulness. -Snow and Ice Melt can be very irritating to pet’s feet. Use only chemicals that ensure they are pet safe and consider wiping off pet’s feet upon coming in from the outdoors. Some dog owners have also had success with Velcro attached booties when their pets go out in this weather. The above, as well as information in the last post, lists a handful of perils that our pets face during the winter months. Your awareness of the particular challenges of winter goes a long way in helping to protect your pet companion.